Capturing beauty and poetry on film is a hallmark for International Hall of Fame Orange County Photographer Mark Jordan. Recently, Crevier MINI asked if he would take his huge talent and lend it to photographing a slightly different subject, a car. Not just any car, but the very striking and character driven MINI Countryman from Crevier MINI based in Orange County, California. As a Master Photographer and member of the American Society of Photographers, Mark has captured poetic portraits for over 30 years. From the pages of People magazine, to the halls and walls of homes and museums, Mark has also received international recognition for his work from such organizations as KODAK, WINONA International, EPCOT Center, FUJI Corporation and Professional photographers of America, Germany and Norway. 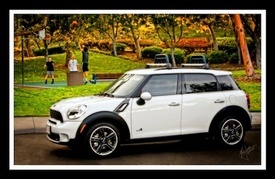 Here, he was asked to capture the character of the MINI Roadster and MINI Countryman in and around Orange County California. “Rather than trying to reinvent the wheel and create images of the MINI similar to those typically seen in promo brochures, we all agreed that a different approach was demanded – one that not only sported the MINI amid the environs of O.C, but reveled the character of the car as how everyday owners actually enjoyed their MINIs. I had heard the rave reviews about the MINI and anticipated a great ride, but having yet to own a MINI (much to my wife’s chagrin), let alone drive one, we hadn’t a clue of the thrill was in store for us. We strapped ourselves in and quickly discovered we would do best to simply surrender to the spontaneous whims of its wickedly nimble disposition. I must tell you, you don’t drive a MINI Countryman, it drives you. It’s like walking a pit-bull on a leash – you can fight it or just let it go. We chose the latter – oh my Lord, the rush is indescribable! “The ultimate challenge in capturing the MINI Countryman is that though it definitively exudes a personality all it’s own, it is not a person – and I specialize in photographing people. Whether it’s the celebrity calling for a new headshot or the family next door needing a portrait for their mantle, the milieu of my existence is people. Thus, the first step I took was to revisit the attributes that inspire me most about portraiture. And for me, photographing people is primarily about relationships – the connection. It’s about putting myself in the shoes of another, sitting behind their eyes and seeing the world as they do. Therefore, the first task at hand was to see the world through the eyes of a MINI (fortunately for me, awaiting on this side of the windshield sits a comfy cockpit). Not only that, I felt obliged to do so in a way that genuinely reflected the fervent affections of MINI owners everywhere. There’s a reason why owners are so passionate about the MINI-experience – in fact, it’s not “mini” at all – it’s something else altogether – something unique and inexplicable. My goal then was to discover and capture it. However, as I began I didn’t have to look much deeper before yet another challenge arose. While the key component in capturing people is honesty, the art of it relies on the intuitive – it’s instantaneous and imperceptible. Once the instant is gone, it’s gone forever. Though we’re well aware that the quintessential difference between the painter and photographer is the moment, considering the defined purpose of my MINI photographic excursion, I’d have to manage both the moment as well as the artist’s interpretive, keeping them in context and at the forefront of my Mini endeavor. Crevier MINI is safely outside the normal boundaries of a car dealership. Whether Crevier is providing a unique car buying experience, or joining with world class portrait photographers to highlight the unique personality of MINI vehicles, Crevier is producing energy with car enthusiasts throughout the world from their home in Orange Country, California. From the pages of People to the halls and walls of museums and homes, Mark’s striking yet poetic portraits have expressed the lives and lifestyles of American families over 30 years. He is a Master Photographer, a Master Craftsman, a member of American Society of Photographers and is internationally acclaimed for his photographic excellence. He is one of a handful of artists, worldwide, who have been inducted as a permanent exhibitor into the International Photography Hall of Fame & Museum. In addition to being named Orange County’s Photographer of the Year, Mark is an eleven-time recipient of the prestigious International Loan Collection Award and has been recognized by such prominent organizations as KODAK, WINONA International, EPCOT Center, FUJI Corporation, Professional Photographers of America, Germany and Norway, and has been honored with awards too numerous to mention. More importantly, every single honor and award Mark has earned has come directly from portrait commissions – that is to say, Mark owes his success to his clients – for it all began with simple inquiries and continues today because of those who honor him with their trust. Crevier is the MINI Cooper Dealer for Santa Ana, Los Angeles and Orange Counties, Irvine, Brea, Yorba Linda, Fullerton, Placentia, Anaheim, Huntington Beach, Fountain Valley, Tustin, Orange, Garden Grove, Newport Beach, Costa Mesa, Westminster, Anaheim Hills and many others! Come visit Crevier MINI and see why so many car buyers have made us their number one choice. If you happen to be in our area (and with a ticket to John Wayne Airport in Orange County, you can be) we invite you to come and see why we are known nationally as THE place to buy a MINI Cooper.